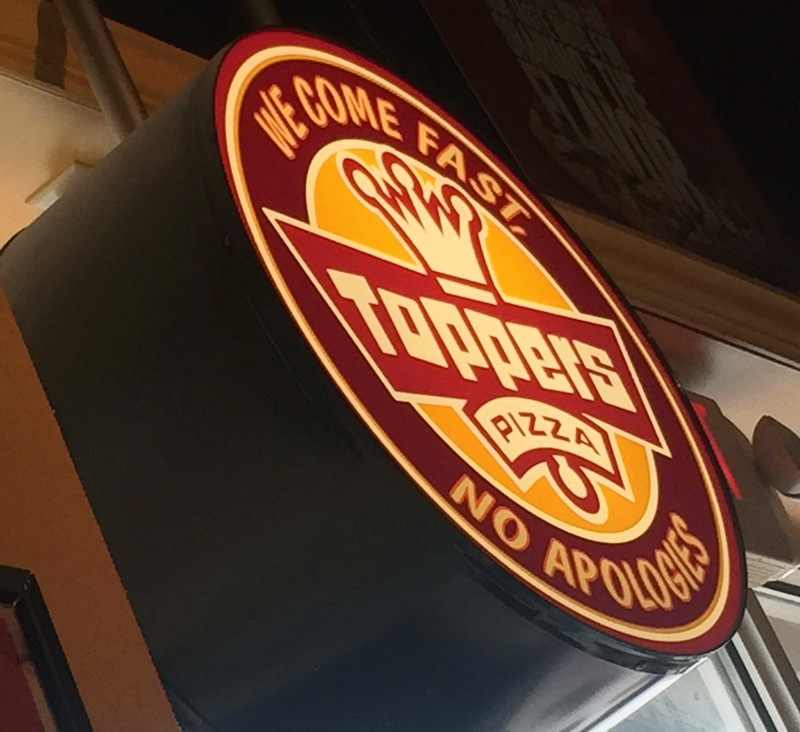 Restaurant Review: Toppers Pizza - Cold Spring | The Food Hussy! I'm not from here. I'm from a place far far away - a land where the ground is flat, the corn is tall and the Taco Pizza can be found easily!!! That's right - Iowa. We have this wondrous place they call Happy Joes Pizza - it's so amazing - they have a Taco Pizza with sour cream on the pizza!!! So why am I telling you all of this? Because I had a hankering for a taco pizza and I was trying to find one in Cincinnati! We came across Toppers Pizza in Cold Spring. This location isn't really much of an eat-in type of place - there are a couple of tables - and we did - but it wasn't very comfortable. The staff was nice though and they do have plates and napkins and such if you need them. They have a great variety of unique pizzas - from the Tot-za (tater tots!!) to the Cubano (pulled pork & bacon honey mustard) to the Maui (pineapple & ham). They also have 16 different dipping sauces you can get with your pizza. Ah yes - my highly coveted taco pizza! It has taco sauce, taco mean, mozzarella, cheddar, lettuce, tomatoes, black olives and green onions - then is topped with tortilla strips. The salsa and sour cream come on the side. It was okay. I think their pizza itself is fine - but it just wasn't the taco pizza I was coveting. 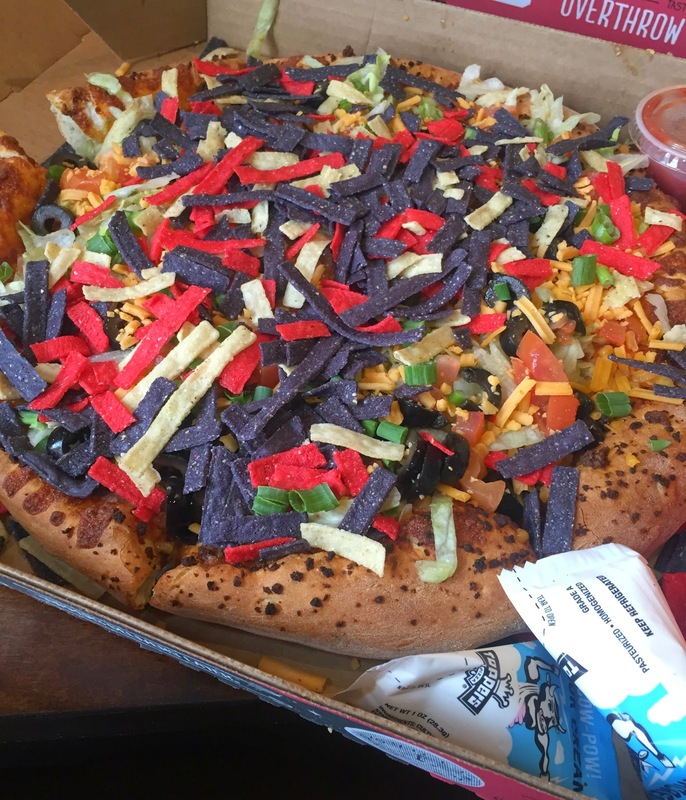 You see - my taco pizza has beans on it, the sour cream comes on the pizza and most importantly - it has crushed Doritos - not tortilla strips. Duh! Oh well - it took care of the craving - at least for a little while. 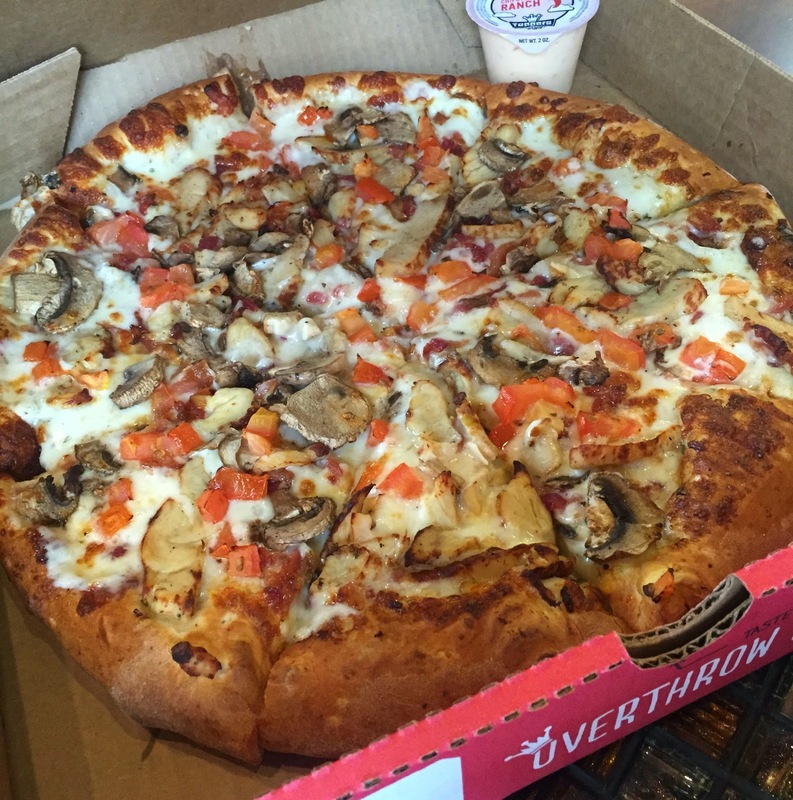 We also got a Chicken-Bacon-Ranch pizza this also had mushrooms on it - much to the chagrin of my coworker. It was fine - I had a piece. We underestimated the size of their pizzas - they are really big - one medium would have been sufficient for the 3 of us. Why Should You Go? Well - I wouldn't go to eat there - but if you're near one - I would get it for carry-out or delivery. I myself really want to try that Tot-za pizza - I mean - TATER TOTS ON A PIZZA?! It might just overtake my Taco as something I crave!